Another chapter that is full of happenings. Hermione is driving Harry and Ron crazy about studying for exams. All three kids want to know what Snape is up to. Everyone is curious about how to get past Fluffy and the other enchantments. Hagrid has a dragon egg! After reading this chapter, our family began a discussion on the dragon egg story. We all found it interesting how Hagrid treated the dragon. What did you notice about Hagrid’s care for the dragon? Norbert is going to be way too big for a home. Dragons bite and their bites are quite dangerous. A dragon could burn your home to the ground. Baby dragons seem to be independent – they can take care of themselves. Hagrid desperately wanted a dragon and ignored the dangers to get what he very much wanted in life. Hagrid treated the dragon as if it were helpless – like a baby human. This brought us to a conversation about how we all do the same thing. The kids had to think for a bit about this one. They just didn’t think there was any way that they could be like Hagrid. We do it all the time though in everyday life and with special foster care circumstances. One child told us that they believed that being put into foster care was their fault, that if they could just behave long enough, they would get to return to their biological home. They saw the situation like Hagrid. This child now realizes that being put into foster care has to do with what adults were doing, not the kids’ actions. Another child explained that they had no clue what was happening when they went into foster care and just saw the situation as adults doing mean things to children. In fact, this child thought their whole life was going to be a series of moves from one foster home to another. To them, adoption was just something that the adults told them about but was not something that was really going to happen. Now the child understands that caseworkers really were trying to keep them safe, they were searching for an adoptive home for the child, and the biological home just was not safe. One of my kids doesn’t like to brush their teeth. Can you relate to that? The child brushes as fast as possible without hitting all the teeth with the brush and only brushes their teeth so that mom and dad don’t get upset. This child sees brushing teeth as a way of avoiding getting into trouble. The reality is everyone needs to brush their teeth so their teeth won’t get cavities and decay. One of our kids doesn’t like to read – A LOT. Dad used to require a chapter of reading from this person every night or else that person has to pay a dollar from their allowance. This kiddo sees reading as a possible way to lose money. In reality if this child doesn’t improve their reading, when it comes time, the school will not let them get a learner’s permit to drive. It will also affect what kind of job they will get in the future. We learned in this chapter that even though Hagrid was seeing things in an odd way, Harry, Ron, and Hermione were not going to be able to change his mind. Why?! Hagrid really, really, REALY wanted a dragon and did not want to see reality. The trio wanted to keep their friend out of trouble, BUT it was not their responsibility. As kids, you see adults and your friends do strange things all the time. It’s not up to you to help adults or friends to change their strange behavior. You are responsible for YOU. Foster kids want their biological parents to change so they can go home. Adopted kids (even our kiddos) want to go back and help their biological parents. However, my kids agree that until a person wants to change, they are NOT going to change. In some circumstances, they can’t change. There could be mental health or physical problems that keep them from being able to change their behavior. You can show a morbidly obese person how to eat healthy, but you can’t teach someone born without legs how to walk. At the end of our conversation about Chapter 14, one child offered this thought explaining that they really loved their adopted family. However, this child really would like to be back in their biological home but knows that there are good reasons for being in the adoptive family, but they wish that the issues were not there. All the kids agreed with him. It’s normal to want to live with the family you were born into. However, this child is still glad for the family they have now. What would be the scariest thing about owning a dragon for you? Is there a chore that you don’t like to do? Why do you have to do it? If you’re an adopted/foster child, why were you put into foster care? Share your ideas and thoughts about this blog in the comments below. Your comments and opinions will help other families as they discuss this topic in their own house. Chapter 7 – Parent Discussion – I’m the Parent. I’m Responsible All the Time. Harry Potter is at Hogwarts and getting sorted into his house. The teachers and head students are getting everyone settled into the Gryffindor, Hufflepuff, Ravenclaw, and Slytherin houses. The chapter focuses on the students and specifically Harry’s anxiety and emotions surrounding his introduction to his new school. 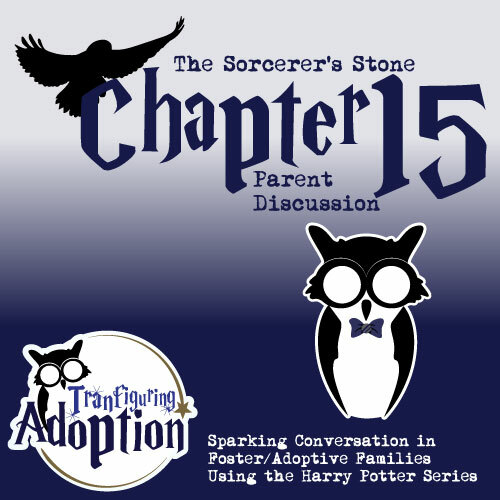 If you read the kids’ discussion that coordinates with the chapter of the Sorcerer’s Stone, you know that the Fink kids chose to talk to other foster/adoptive kids about the first night in a new home. Again… a lot of emphasis is placed on the fears of the kids in this situation. 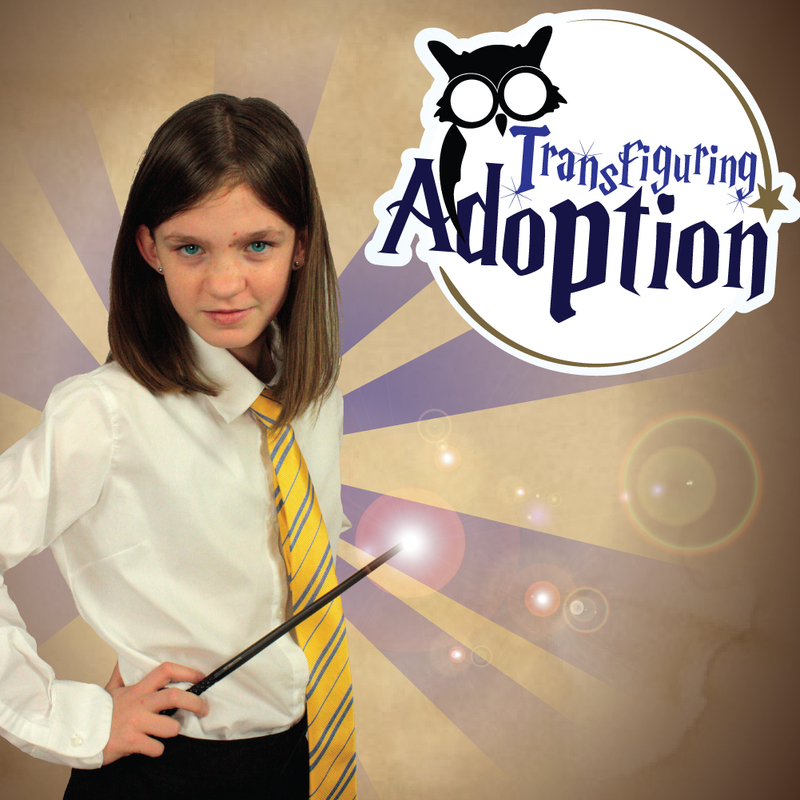 What does it look like for the adoptive/foster parents during the first night? My wife, Margie, recalls the whole situation and relays this thought to me. She remembers being an elementary school teacher and being nervous about the first day of school. Oh sure, there was excitement in the air too. However, there is a lot of responsibility in caring for someone else’s child for the majority of the day. There can be numerous personality and behavior obstacles in addition to academic obstacles to overcome. Courage came in knowing that the FULL responsibility did not lay on her shoulders, and that children would go home to their caregivers at the end of the school day. The children were dropped off by their caseworker, who had to run off to her next appointment. We were suddenly thrust into parenthood without any information about these two new strangers in our home. However, the afternoon and evening went quite nicely and then the night came. In the midst of those fears, we hear a blood curdling scream from a bedroom. I race to the room where the yelling is originating to see a child thrashing in bed. I hold the child in my arms and assure them everything is alright. Even though they have awoken, they continue to scream as though I should be seeing a dagger coming form their belly. Finally, the screaming stopped, and the child went back to sleep. That was my first introduction to night terrors. I would like to report that like Harry, things were completely wonderful the next day. It was actually the beginning of a slow trial by fire through the foster care system that was worth the journey. Take the week off work – even if we could have worked out the details with daycare, I think any foster/adoptive parent needs AT LEAST one week of uninterrupted bonding time. Become a hermit – Most people immediately want their friends to meet the new child. Don’t do it! For AT LEAST a week just keep it down to the immediate family. The bonding time with the new child is huge. Simple, not special – Do whatever you can to simplify the first week with the new child. Instead of thinking of special meals, plan ahead of time to make frozen dinners that just have to be heated at home (don’t eat out because that violates the previous suggestion). Set the bar low – Do not assume that you are going to be super mom/dad. Simply assume that you’re going to get to know the new child better. If you learn something new about them for the day, it was a successful day, and you need to celebrate. Don’t belittle the small victories. Comment below on your first night experience with your child. Use the comment section below to give people who are thinking about adopting/fostering advice for preparing for a child. Share any thoughts or ideas that you had about this chapter. Use the comment section below to share some of the fears and questions you have. How are you planning to get the most bonding time with your new child the first week? What do you think about the idea of becoming a hermit for AT LEAST a week with your immediate family? Share any thoughts or ideas that you had about this chapter below.